Pictured (l-r): Elizabeth Bushey (Mill River), Ian Dansereau (Mill River), Zachary Hyde (RHS), Max Bushman (Stafford Technical Center), Beccalynn Dugan (Stafford Technical Center), Haley Andrulat (RHS), Olivia Lyons (RHS), Maricate Mangan (RHS), Kyra Traska (MSJ), Kyle Anagnos (MSJ), and Jillian LeBlanc (Proctor). 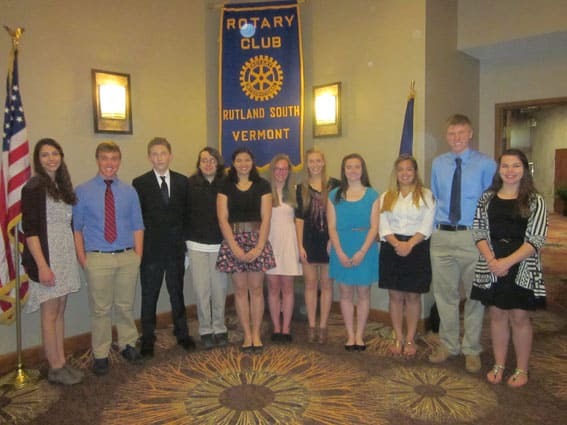 RUTLAND — The 2015 Rutland South Rotary Club Scholarship recipients are a group of dynamic individuals with impressive resumes and lofty career goals. In keeping with the motto of Rotary, “Service Above Self” these high school seniors also give back to their communities through an assortment of public service projects. Scholarship awards amounting annually to $13,500 are Rutland Rotary South’s biggest philanthropy. In fact, this event has spanned over 36 years and to date, around $360,000 has been given away to deserving Rutland Area high school seniors. The schools that participate in the program are Mill River Union High School, Mount Saint Joseph Academy, Proctor High School, Rutland High School, and Stafford Technical Center. The awards are $1,500 and $1,000.